We are often exposed to suffering, and most often we are left wondering ‘what is the purpose?’ Rarely, do we get to understand God’s plan for the immense toil that our world endures. But sometimes, we must also acknowledge that suffering can be, surprisingly, paired with blessing. Last weekend, on Friday night, I had an alarming confrontation with my own human frailty. My symptoms started during the day on Friday. I felt achy, had a fever, and struggled to teach my morning classes. I took it easy in the afternoon, popped some Tylenol, and went to bed early. I lost consciousness soon after my head hit the pillow. After falling into a deep sleep, I woke up shaking uncontrollably at 2:30AM. My head was burning up, and the rest of my body was so cold that I could barely break the silence to cry out, “Woody!” to my sleeping roommate. “Do you want a sweater?” he asked casually. Once Woody got out of bed, he noticed the severity of my shakes. He ran to our closet, and tossed the blanket over my body. He picked up my phone and began searching through my contacts for someone to call. “Woody can you cover my feet?” I asked. My feet were already covered, but he ruffled the blankets around to make me think there would be a change. Woody tossed the phone aside, got on his knees, laid a hand on me, took a breath, and calmly said a prayer asking for help from the Almighty God of the Universe. By the time he uttered ‘Amen,’ my shakes had calmed down and I was as at peace as I’ll ever be. Woody got me a glass of water, but my hands were still shaking too much to take more than a sip. I decided I just wanted to go back to bed, and I didn’t want to bother with a hospital visit just yet. Another prayer was offered, and I slept through the night. “How are you feeling? asked Woody the next morning. “Much better, do you still want to go sailing?” I replied. 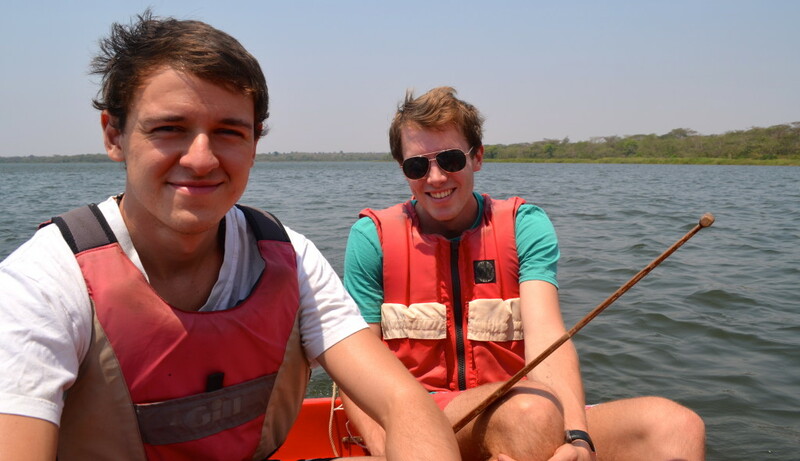 There’s a reservoir about 20km outside of Lilongwe that Woody and I had planed to sail at that Saturday. Woody tried to talk me out of going, but I felt fine and I was dying to get out of the house. So again, I popped some Tylenol, and off we went. Four of us crammed into a small red catboat, and cast off for a couple miles. Every few hundred yards there were natives bathing and kids playing in the water. Allegedly, there’s also a hippo in those waters, but we never saw it. We got home, and I felt fine, up until about 6:30PM that night. And then I crashed. The same symptoms from the day before quickly overtook me. Emily, a biology major with nursing experience, talked me into going to the hospital ward. “No, you are not good. Tell me what is wrong” was his friendly reply. I spent the next night in the hospital while they injected anti-malarial, and anti-bacterial infection medicine into my arm through an IV. At one point, while the nurses monitored me, my temperature spiked to 102.8F. The whole night would have been a scary experience, except that I had a huge surge of unexpected support from the campus community. Probably 20 people visited me that night, some of which stayed for hours at a time. Even 2 of my Pre-Calc students, who happened to be on campus, stopped by my room. And to top it all off, Woody took up his roommate duties and slept in the hospital bed next to me all night. The next morning, Sunday, Woody and I got up and had the intention of going to church. I informed the nurse on duty that I would be back after the service. He begrudgingly complied. But after the short walk up the hill to my house, I discerned that I ought to immediately check myself back into the hospital. I underwent another treatment of anti-whatever medicine, and checked myself out of the hospital for good later that afternoon. Monday I stayed home from school and instead visited the American doctor. Her prognosis was Tonsillitis. To be sure, she had to do yet another blood test. I was sat down in an operating room next to a burn victim. The lady sitting next to me had sever damage done to her right arm, and a nurse was using a metallic utensil to take pieces of flesh off of her hand and pile it on the table next to me. I had to hold my breath and look away to maintain my breakfast. 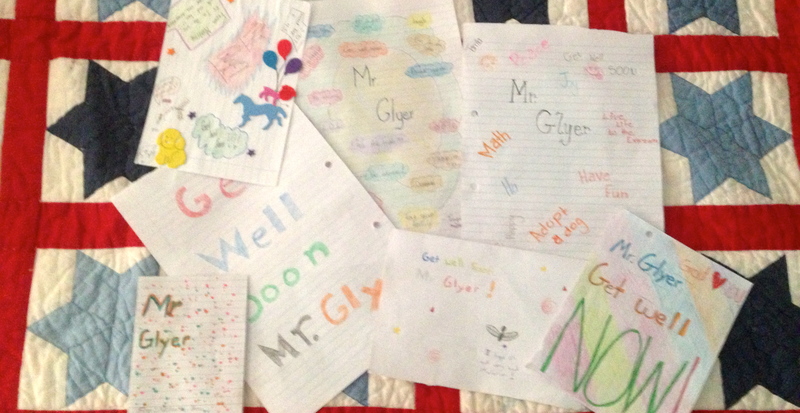 But maintain my breakfast I did, and later, after going home, my TA brought me a fistful of get-well cards that my 7th graders had made. Those cards may have been the most effective treatment I received all weekend. Tuesday I stayed home again, but sent Amy with a note explaining my absence to the headmaster of the Academy. Within an hour, he had left the school and was at my house making sure I was okay. A very thoughtful gesture. Wednesday I began feeling remarkable better. I was back on school grounds walking around like Joseph Gordon Levitt dancing to ‘You Make My Dreams Come True.’ Looking back, and even during the experience, I was able to see God’s goodness, peace, and provision. 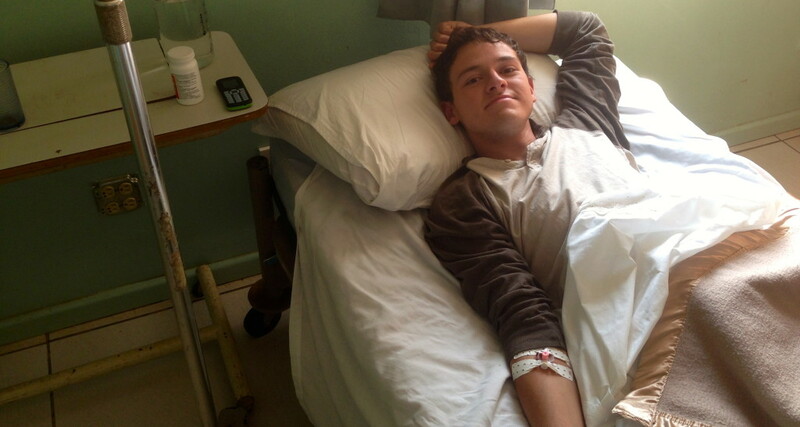 This entry was posted in Malawi on September 29, 2013 by Gret Glyer. As it happens we have been praying for your health! Hope you have a full recovery. Beware that while in Africa sickness always means LOTS of VISITORS all the time. That’s why people have to leave the country to recover! We continue to pray for God’s blessing, guidance, wisdom and strength for you. Yes I’m sure 🙂 I know I would!